"Thanks for all of the fun and experience that I have gotten though Amateur Radio Direction Finding (ARDF). It really paid off this week!" That's what Sam Vigil WA6NGH wrote in an e-mail that I just received. He was referring to the radio direction finding (RDF) skills he had developed in recent years that made him a key player in finding a lost Alzheimer's patient. When persons with dementia wander away from home, most are recovered within two miles. However, this 83-year-old victim traveled over 16 miles. But I'm getting ahead of the story. Sam and his wife Eve, KF6NEV were among the first to volunteer when Project Lifesaver began in their area three years ago. About 35 local citizens with Alzheimer's disease and developmental disabilities are wearing wristband transmitters that can help searchers quickly find them if they wander from home. Just like wildlife research radio tags, these transmitters emit 25-milliwatt pulses at about one-second intervals on individually assigned frequencies near 215 MHz. Sam and others have spent many hours in training to perform RDF rapidly on these pulsed signals from the air and on foot. The San Luis Obispo Project Lifesaver team was called into action on December 10, 2007 to find a Pismo Beach man in the first stage of Alzheimer's disease. "He is very fit physically," Sam wrote. "He has good long term memory, but is deficient in the short term. His wife reported him missing when she came home from work at 5 PM." Sam continued, "Eve and I responded with three other direction finding teams, checking for his wristband signal on all streets for a two-mile radius. We knew that he was on a bike, but didn't find out until about 30 minutes into the search that his range of biking in the past has been from San Luis Obispo to Santa Maria, which is 35 miles! From past testing, we knew that range of the transmitters is only about a mile, so we needed air support. 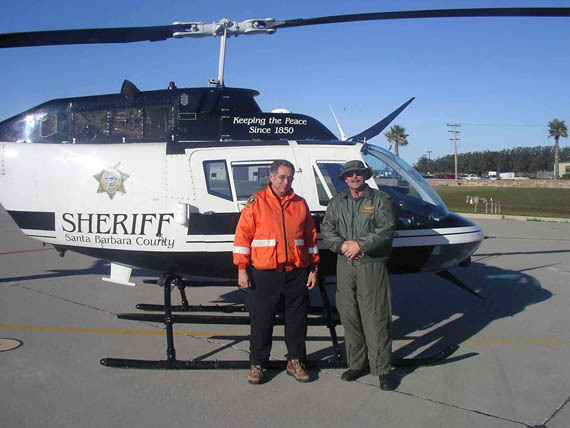 Project Lifesaver normally utilizes California Highway Patrol (CHP) or Vandenberg Air Force Base helicopters, but Santa Barbara County came through first this time. "Eve and I boarded at Oceano County Airport at 9 PM. The orders of Incident Commander Jon Wordsworth were for our pilot to fly south to Santa Maria and work our way back north. As soon as we crossed the Santa Maria River, I picked up a weak signal. For the next 20 minutes, we followed the biker around the north side of town as we called in the three ground teams. Just as the first team got there, we had to leave to refuel, which took about 15 minutes. When we got back over town, the signal was gone! "As we tried to reacquire the signal, we got a radio call that one of the ground teams was hearing it weakly to the north of Santa Maria. We headed north across the river and immediately picked it up. We were not able to see the biker, even with the Night Sun searchlight and night-vision goggles. Nevertheless, we were able to vector in the ground teams with our bearings. "By then, the patient had reversed direction and was heading south again toward the Santa Maria River. The river is pretty dry but we were concerned that if he went down into the riverbed, the ground teams would have great difficulty finding him safely. Fortunately, he was starting to slow down. At 10:38 PM, a ground team spotted him on a frontage road next to Highway 101. He was in good shape, with mild dehydration, and was medically released to his wife that night." There is no question that RDF played a vital and possibly lifesaving role in this rescue. By contrast, Sam tells of another dementia victim in his area who wandered away in 2005: "That subject was not wearing a wristband transmitter. It took three days and two nights, over 120 searchers from four counties, and three helicopters. When found, he was near death from hypothermia and dehydration." 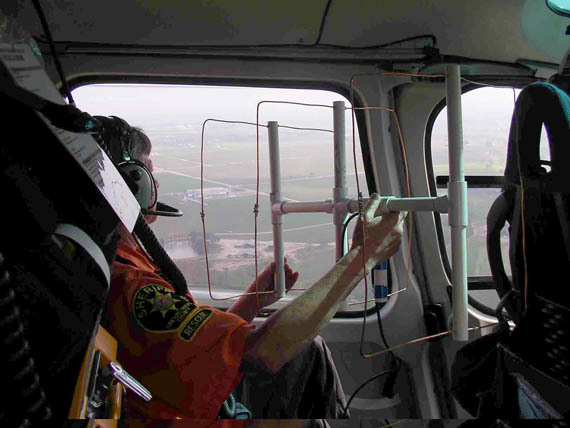 The standard ground and airborne RDF antenna for Project Lifesaver is a lightweight 3-element Yagi, but volunteers and pilots agree that the two-foot long elements of this antenna are very awkward inside a helicopter. Externally mounting the Yagi is not practical because any one of a large number of aircraft might be called for a search. Sam says, "In some jurisdictions, they open the door and put the DFer is out on the skid in a harness! The CHP is unwilling to do that." WA6NGH got the idea of using a cubical quad, which at 215 MHz has square elements that are only about one foot on a side. In addition, VHF transmitter hunters have discovered that quads are less affected by nearby objects than equivalent Yagis. Sam scaled down the two-meter stiff-wire quad design from my book and optimized the gamma match. "Now we can do direction-finding from the safety and relative comfort of the chopper's back seat, shooting thru the Plexiglas," Sam reports. "The quad is not only easier to handle, but its performance is better than the Yagi." Other hams involved in this search were, in alphabetical order, Mark Calcagno KC6BAZ, Anne Marie Foster KI6BMC, Claudia Hayner KG6AKN, Donald "Rusty" Hobbs N6OCR, Beth Ries-Wordsworth WD4NGU, Dave Smee KG6TXN and Jason Waddell KF6BOP. "You don't have to be a ham to do Project Lifesaver tracking," says Sam. "Some are not. But I think that my ham background and most importantly my ARDF experience has made a difference in my ability." WA6NGH tried foxhunting for the first time at the 2003 ARRL Southwestern Division convention hunt that I put on in San Pedro, CA. After a few more local events, he entered the 2004 USA ARDF Championships in southern California. He also took to the forest courses at the 2006 championships in North Carolina. Project Lifesaver began in Virginia eight years ago and has expanded steadily ever since. In addition to the San Luis Obispo group, I have heard from hams in Yamhill County, Oregon and Elkhart County, Indiana who are using their RDF skills in the program. For more information about Project Lifesaver in California, contact Jon Wordsworth, the State Coordinator. Elsewhere in the USA, visit the Project Lifesaver International Web site. It isn't often that I get to spend an evening combining two of my favorites: ARDF and fine music. When Marvin Johnston KE6HTS e-mailed to invite my wife April, WA6OPS and me to meet Igor Lazarev USØVA, we already had plans to get together with two other hams at a Christmas concert in Pasadena. We invited Marvin and Igor to join us at the evening event and they accepted. In five vehicles, we all converged on the Pasadena church just in time, including Igor, who successfully followed our driving directions from Los Angeles airport with neither a ham transceiver nor a cell phone. After the concert, Igor and the group were treated to a pipe organ crawl and visit to a satellite earth station in Burbank, all while chatting about ARDF in our respective countries. It was international good will by Amateur Radio at its finest. Igor Lazarev USØVA (left) of Ukraine and Marvin Johnston KE6HTS get a satellite uplink station tour from Christie Edinger KØIU. USØVA is an orthopedic scientist. His expertise is in the treatment of patients recovering from disease and trauma to muscles, bones, tissues and nerves. The equivalent medical specialty in the USA is physiatry. With this background, Igor was an excellent choice to be primary physician for the 23-member Ukrainian ARDF team. His wife Nataliya, who could not go on this brief trip to the USA, is a gynecologist who handles medical issues of the girls and women on the team. Marvin and I peppered Igor with questions to help us understand the constant superiority of the Ukrainian ARDF program. April, who has been the Field Medic for recent USA championships, wanted to know all about treatment of sporting injuries during training and competitions in Europe. Another topic was the difficulty of obtaining visas for some countries' visitors to ARDF events in the USA. Ukraine is the second largest country in Europe, approximately the size of Arizona and New Mexico combined, with 46 million inhabitants. When the first Ukrainian ARDF events were held near Kiev in 1957, Nikita Khrushchev was at the height of his power and this region was part of the USSR. 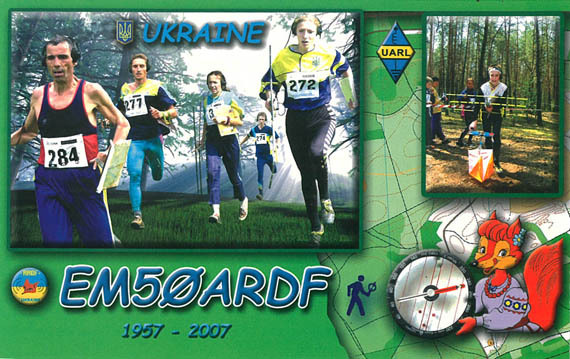 In those days, international-rules radio-orienteering was strictly a European sport, closely tied to the military and government schools in Soviet countries. USSR was always near the top of the medal count at the World Championships. With the breakup of the Soviet Union, Ukraine became an independent republic in 1991. Former Soviet countries then began competing against each other at ARDF contests, where Ukrainians were and continue to be in the top tier. At the most recent World Championships in 2006, Ukrainians took home 15 medals, including 7 golds. At least one Ukrainian finished in the top five in every age/gender category on 80 meters, and in all but one category on two meters. Serhiy Zarubin and Volodymyr Griedov UT5UAZ of the Ukrainian ARDF team came to the USA in 2001 to compete as visitors in the First USA ARDF Championships in Albuquerque, New Mexico. They took first and second place overall in their age category on both two meters and 80 meters. Serhiy completed the 80-meter five-fox hunt in less than 37 minutes, setting a USA Championships course record. What are the reasons for the Ukrainians' success? First and foremost is constant training. As soon as the snow clears, regular local events begin all over the country. Competitors measure their skills against one another weekly through the spring and summer. Second, the old ties to the country's schools and conscription-based military remain strong. For those in the military, there is extra incentive to do well. Ukraine's national championships select the best foxtailers in each age/gender category, who receive additional training and medical support as they prepare and travel together to the World Championships. National funding to support Ukrainian ARDF is down markedly from years past, but a strong program continues with volunteer support. Stateside hams can't emulate the concentrated national training regimen of the Ukrainians because the continental USA is 16 times larger and travel costs would be prohibitive. Our once-a-year championships have drawn radiosport enthusiasts from Santa Barbara to Boston and Seattle to Daytona. We need concentrated training in all those communities and elsewhere in our country. You can get involved by organizing ARDF classes and practice sessions in your own area as well as by promoting the sport to your local ham clubs, schools and Scouts. Like our ARDF national championships, the Ukrainian nationals are open to all. Igor wants stateside radio-orienteers to visit his country. Ukrainian championships are at the end of April or beginning of May. Besides learning and competing, you can take tours of the country, including a visit to the infamous Chernobyl reactor site on the Belarus border. 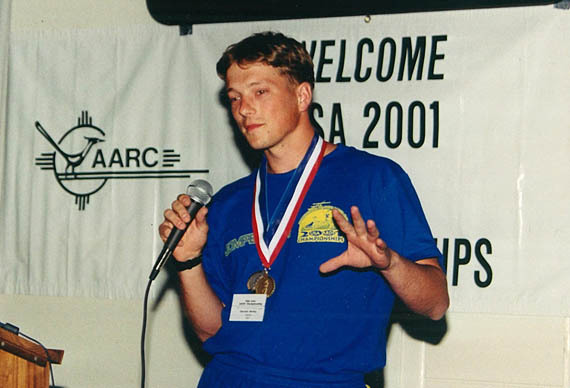 Serhiy Zarubin of Ukraine won a gold and a silver medal at the USA ARDF Championships in 2001. He took the mike at the awards ceremony to thank all for their hospitality. For more on small pulsed transmitters and receivers in the 200 MHz region, see my "Homing In" column for the Spring 2006 issue of CQ-VHF. © 2008 Joseph D. Moell. All rights reserved.